The first stop on The Garth Brooks World Tour with Trisha Yearwood, has shattered Garth’s previous record for ticket sales in a single city in North America. Previously, the record was 162,822 tickets sold for the Target Center in Minneapolis from October 6th through the 14th, 1998. Chicago ticket sales have officially surpassed that and are continuing to sell. The Garth Brooks World Tour with Trisha Yearwood will begin September 4 at 7:30pm. Subsequent dates in Chicago are September 5 at 6:00pm, September 6 at 6:00pm and 10:30pm, September 11 at 7:30pm, September 12 at 6:00pm and 10:30pm, September 13 at 6:00pm and 10:30pm and September 14 at 7:30pm at the Allstate Arena in Rosemont, IL. Tickets for the Philips Arena in Atlanta will be on sale tomorrow, Friday, August 8th at 10:00 AM EST. There will be a six ticket limit per purchase. They can be purchased at ticketmaster.com, 1-800-745-3000 or Ticketmaster Express 1-866-448-7849. Please note there will be no sales at the venue box office or Ticketmaster outlets on August 8th. Tickets will cost $56.94 plus $4.56 tax, a $4.00 facility fee and a $6.00 service charge, totaling $71.50. Country Music News Blog participates in advertising programs that help fund the operation of this site. For more information please visit our privacy statement. 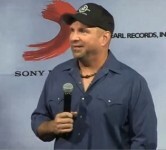 This entry was posted in Garth Brooks, News by Shauna "WhiskeyChick" Castorena. Bookmark the permalink.